Friends, we’re here to tell you all about the awesome concentrate, rosin, and how you can easily make it yourself at home. Rosin is the cannabis concentrate taking the dabbing world by storm. If you’ve been into a dispensary, you’ve definitely seen it. If not, you might have no idea what is it. Friends, we’re here to tell you all about this awesome concentrate, and how you can make and enjoy it. Rosin is a cannabis concentrate. Like shatter, wax, and oil, rosin is incredibly potent. Unlike other concentrates, extraction does not require a solvent. Therefore, the production is less expensive and less complicated (since you don’t have to worry about cooking off chemicals like Butane). For those who worry about what goes into making cannabis concentrates, this solventless option is incredibly appealing. The process of extraction used to make it requires only heat and pressure; it’s so simple you can even do it at home – in about 15 minutes if you can believe it. What is amazing, is that you probably have most of these things in your house already. In short, you press out the extract using the straightener. Make sure your straightener is at about 300 degrees and you should be good to go. During extraction, it will appear to be like a wax but becomes brittle like shatter when at room temperature. Rosin, like dabbing, is a fairly new way to enjoy cannabis. To dab, you need an oil rig! 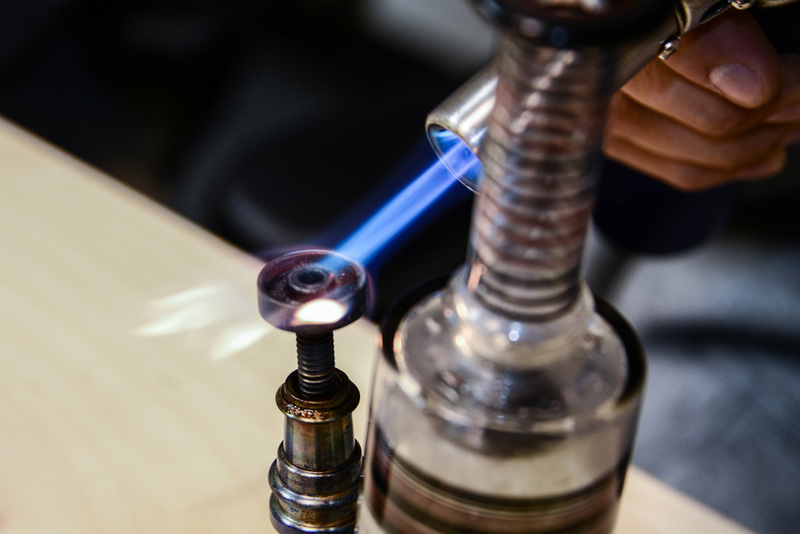 Dabbing involves heating a surface (a nail) and then inhaling the vapors. Dabbing has recently become a more common way to enjoy the many concentrates offered to the cannabis community. Dispensaries sell rosin. It isn’t always available, though, so make sure you call ahead to see if they have some along with their other concentrates. Also, be prepared to pay more for it than flower – it does have a higher concentration of THC, so it’s worth it if you enjoy dabbing. Also, you can make rosin with any flower that you have, so don’t rule out this option. If you’re someone that has never waded into making concentrates, we understand your hesitation, but there are many resources online that will help you navigate the very (we mean VERY) simple extraction process on your own. YOU CAN DO IT! So, are you going to add rosin to your collection of cannabis? With rosin, you get the benefits of a strong concentrate with the ability to extract it own your own. Why not give it a shot, right?